Well, you would. Wouldn't you? You'd be tempted just like Sarah. To step back into the past to grab back a piece of your childhood or, as in Sarah's case, to find out if you had good or bad parents. The theme of parenthood and childhood has been particularly strong throughout this year's stories. From Maria and her dad leaving for Washington to Clyde dealing with his errant father, the bonds between adult and child have been explored in some depth. Now it's Sarah's turn, in perhaps one of the strongest, if not the strongest, scripts of the series to date. Gareth Roberts is obviously deeply attached to Sarah and it shows in his script in the way he carefully handles the still sensitive trauma of Sarah's dead parents and slowly unravels the mystery surrounding their fate. He does it without cheapening the idea and provides terrific emotional development for the character that the parent series rarely bothered about. That chap with no eyes, bad teeth and a big hood and a reputation for laughing maniacally. When a time fissure opens and disgorges a child from 1951 and from the village of Foxgrove, Sarah's tempted to go back and see just what Barbara and Eddie Smith were really like. And I suppose, like any of us presented with such an enticement, she goes through denial, excitement and then the suspicion that it's all a trap. And like all good scripts. the audience is already ahead of her and knows that this is a return match with the Trickster. That chap with no eyes, bad teeth and a big hood and a reputation for laughing maniacally. And much as the lady doth protest, 'I'm strong enough to say no', immediately we see the camera pan across a vivid pink 1950s style outfit, those dissolves of her zhushing her hair and putting on her slap, we know she's been reeled in. She's going back. Yeah, it's just like the classic Carole King song, 'Goin' Back' - full of warmth, anticipation, fear and a sense that she's attempting to reconcile thinking young and growing older and realising perhaps it isn't such a sin to do so. It's a lovely sequence, blessed with a fantastic score from Sam Watts and a Lis Sladen performance that might leave you with a lump in your throat as she sneaks out of the house in childlike eagerness for a date with destiny. What's the point in being grown up, if you can't be childish sometimes? Tommy Knight's performance, especially his chemistry with Lis, is great too and I love their mutual mockery over the pink outfit she wears to go back in time. Their discussion on the ramifications of meddling with your own past gives a little nod to the Blinovitch Limitation Effect as well as Luke recognising his own normalcy in the excitement of the opportunity. Ever mindful, Sarah also understands that if it is a trap she'll have a chance to find out whilst giving herself an excuse to be self-indulgent. Again, more lovely character moments powering the script along. 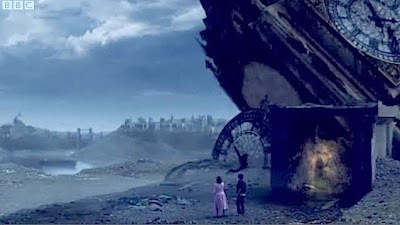 Fortunately, Roberts knows which side his bread is buttered with the Sarah and Luke relationship and doesn't leave Luke separated from Sarah, depositing him back in 1951 with her when the fissure collapses. Roberts' script is chock full of these abandonment issues and he recognises that without our even being aware, they can wreak havoc with social and family life. 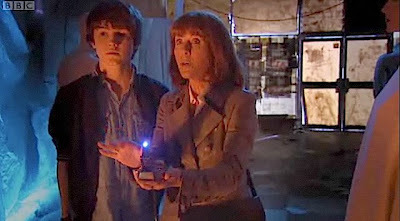 Whilst Sarah and Luke explore Foxgrove in warm sepia tints and as a land of milk and honey, Clyde and Rani give us a quick flashback to last year's Whatever Happened To Sarah Jane Smith to re-acquaint us with the alien puzzle box and the Graske. These aren't gratuitous references and genuinely feed in as proper elements of the plot. The period detail for Foxglove is used well with costumes and vehicles adding just the right touches to embellish Sarah's lines about the emergence of Britain from post war austerity. Then there's that great double take as Sarah hears a voice calling her and Graeme Harper crash zooms the camera onto her face as she stares directly at her mother cradling her younger self. It's at this point that we can see how cunning the Trickster's plan is as the sin of temptation really gets hold and Sarah thinks of a way to find out why her parents abandoned her in 1951. Roberts' script is chock full of these abandonment issues and he recognises that without our even being aware, they can wreak havoc with social and family life. These feelings, and especially fears of being left behind, are incredibly strong motivators both within and outside of relationships. There's a typically humourous Luke response to guessing how many gobstoppers are in a jar and the fun continues when Sarah introduces herself as Victoria Beckham and Luke becomes David in a proper laugh out loud moment. The flipside of this is a growing tension as Luke spots the strange schoolboy, Oscar, who came through the fissure earlier and Sarah, worryingly, starts to get obsessed about Barbara and Eddie. Lis and Rosanna Lavelle as Barbara are very natural in their scenes together and Rosanna is especially good when she recounts how Eddie courted Barbara with little notes. Notes that will later be significant; much like the newspaper that Luke shows Sarah. It's then that both she and us, the audience, realise that things are going to go very wrong as she contemplates changing a fixed point in time. Blimey, she even name drops the miners of Peladon as she works herself up into a selfish, emotional outburst. It's quite powerful stuff to see Sarah throwing a wobbly like this and then gambling with the nature of time and trying to play the game of life to win her 'reward'. She's positively unhinged! Didn't seeing Sutekh's alternate 1980 teach her anything? The best episode this year. Meanwhle, back in the present Clyde and Rani are confronted by the creepy Oscar and the trap is finally sprung with Robert Madge as Oscar doing a nice line in Harry Potter malevolence. He changes into the pixie like Graske and gives chase, with Graeme Harper then pulling off a magnificent double whammy of a cliffhanger where Clyde and Rani are plunged into an alternate, desolate Greenford and Sarah and Luke end up beneath the ruins of Big Ben. What is it with Big Ben? It's a much abused monument these days. We're left with the Trickster ranting away in triumph as Sarah gets her reward for buggering up the timelines. There's really very little to fault this and it's played well by the ensemble cast, with Lis outstanding here, aided by a script full of emotional power and big ideas and Harper's penchant for giving us powerful visuals.The best episode this year. Off to CBBC with you! And Part Two. Now, here's where it all starts to get rather over familiar and somewhat predictable. It's clear that the ontological paradox of Sarah meeting her long dead parents only to be the catalyst for their demise smacks rather too much of Father's Day from Doctor Who Series One. Gareth Roberts even puts a similar TARDIS/police box gag in plain sight to seal the deal so I hope he's offered 50% of his fee to Paul Cornell. Despite all the similarities to Cornell's script, it's still a highly enjoyable episode. The big problem I have with this episode, and it's a pivotal moment in the story, is how easily Barbara and Eddie accept that this mature woman in bright pink with a young teenage boy in tow is actually their daughter, Sarah Jane. Neither Rosanna nor Christopher Pizzey, playing Eddie, totally convinced me with their otherwise fine performances and the script doesn't help either. 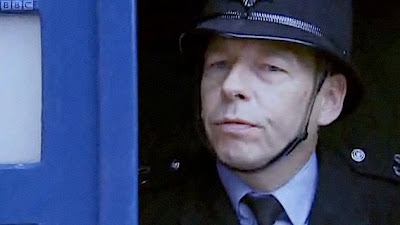 It's a very weak scene, never mind a weak point in the web of time, that forces the characters to jump to certain conclusions, 'It's all my fault', cries Sarah Jane. Yes, love, and if you hadn't been so uncharacteristically selfish to the point of stupidity you wouldn't have to kill your own parents now, would you. It's again a bit of a stretch of Gareth Roberts to suggest Sarah is this moaning, selfish cow who doesn't give a fig about the web of time until she's devastated the Earth. But then, it's an extremely emotional situation. People do the craziest of things. And, naturally, Sarah's not going to kill her parents as, predictably, they're going to volunteer to go to their own deaths. 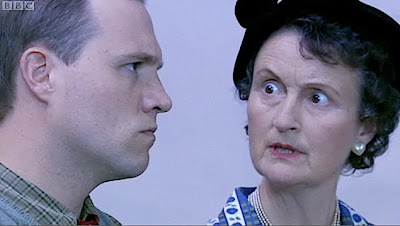 Despite coming across as a remake of Father's Day and potentially sullying that episode's own emotional power, I liked the scenes with Rani's mum in the slave encampment. It provides a very different aspect to the normally cheery Gita and Mina Anwar's performance is very edgy and disturbing when she explains the fate of the last humans. Clyde, like Sarah Jane back in 1951, is determined that there is another way to restore the time lines and it's a nice little parallel for the separated parties as well as an opportunity for Clyde and Rani to be ahead of the game after Gita's explanation about Sarah's parents. When Rani challenges the Graske, claiming he's just as much a slave of the Trickster as the humans are to him, we get a lovely bit of back history, complete with flashback, into how he was roped into working for the big fella with no eyes. It almost raises some sympathy for the Graske in its own way. And Rani's little kiss for Clyde as she ventures alone back into the past is a sweet coda to an intriguing scene where again the emphasis is on underlining the major theme of ordinary people selflessly saving the universe. More laugh out loud moments in the village hall when Rani arrives, 'Yes, hello, ethnic person in the '50s' (which will satisfy or annoy certain pedants who moan on about these things endlessly) and Georgie Glen, fabulous as Mrs.King, steals the scene, as Rani departs, with her comment, 'What on earth was she wearing? Can that really be the fashion in the Punjab?' Wonderful comic timing there. And as disjointed as the reasoning may be behind Barbara's eventual realisation of who this mad Victoria Beckham really is, it doesn't detract from the properly heart-wrenching scene where Sarah's parents accept they must sacrifice themselves to save their child and correct the time line. That group hug between parents and daughter is very moving and you've a heart of stone if you don't get just a little moist at that scene. And that little moment where the screen wipes back from monochrome into warm sepia is a bit of visual icing on the cake from the always reliable Graeme Harper. Unfortunately, the demise of the Trickster looks more like a citizen's arrest of the local drunk than the defeat of a time meddling mastermind. I was hoping for much more from the Trickster than just another man in black trounced by humans volunteering to sacrifice themselves. His brigade made Donna turn left, for heaven's sake! He can't just blow up in a puff of smoke after being shouted at. Well, never mind. The bittersweet conclusion just about makes up for it and thankfully provides some closure on Sarah's abandonment issues and a perspective for Clyde and Rani about the joys and sadness that come with a life spent defending the Earth. The note on the back of the photograph of Sarah's parents is a poignant and fitting final shot. The episode might blatantly recycle many of the tropes of the parent series when it comes to the noble art of self-sacrifice but I enjoyed it and accepted that a certain amount of rehashing of concepts were going on in the story. It's saved by its performances, some great visual flourishes - notably the high camera angles and the depiction of a devastated Earth using nothing more than extras, a quarry and some smoke effects - and carefully timed one-liners. Not as good as the first part but as a whole it is the strongest story of the series so far.